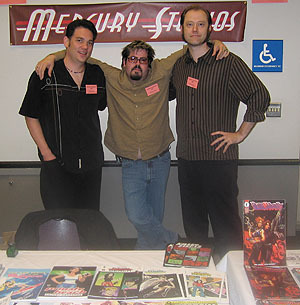 Left: David Hahn, Matthew Clark, and Paul Guinan at Steve Miner's comic book convention in Seattle. We love these one-day shows. 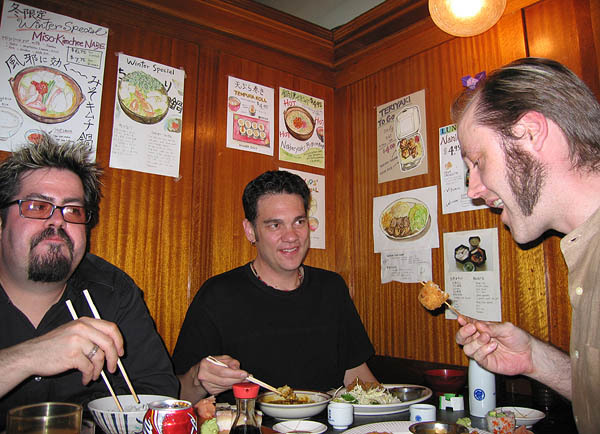 We drive up to Seattle, eat good chow (see below), and trash our suite. That’s right, we were put up in a suite--thanks, Steve! It wasn’t until several hours into the trip before any of us brought up the subject of Star Trek. I know it sounds incredible, but it's true! Above: Matthew doesn’t mess around when it comes to Star Trek toys. The packaging for these Japanese imports doesn’t show which starship you get, so you have to buy an entire case to make sure you get the ones you want. 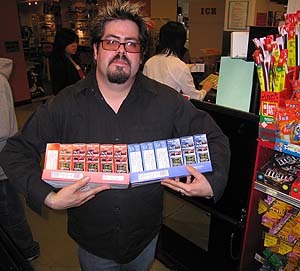 Taking advantage of collectors--for shame! 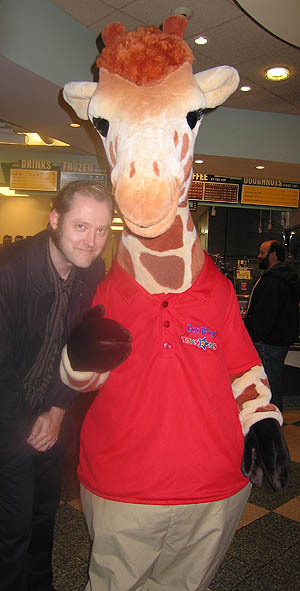 Right: Paul didn't buy any toys on this trip, but was thrilled to meet the Toys 'R' Us giraffe Geoffrey, who sells toys at a reasonable markup to good kids all over the world. Geoffrey was on break at the nearby doughnut shop. It was a magical mall just off I-5.